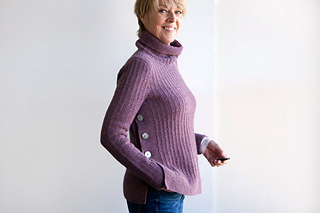 Introducing Delicious Toast – a high collared, side-buttoned pullover, perfect for seasonal transitions. This is a top down knit with almost no seaming. Its slouchy collar and slim sleeves are worked in the round while its bodice is worked flat – front and back worked separately due to their side buttoning attachment left open below the waist for easy wearing. Worked overall in a 3 stitch by 2 row repeating Garter Rib, its edges are trimmed with stretches of basic Garter. Short rows at intervals even out gauges between them. Sleeves are set-in. Here’s the related blog post about its name :). Enjoy! – shown in size 36½“/ 92.7 cm, worn with no ease. 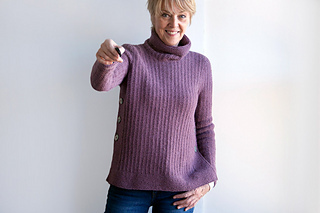 Shown in Owl by Quince & Co. (50% American Wool, 50% American Alpaca; 120 yds per 50g skein); color – Amethyst #325; 10, 11, 12, 14, 15, 16, 17 skeins, or for comparable yarn, approximately 1180, 1290, 1420, 1580, 1710, 1865, 2000 yards / 1080, 1180, 1300, 1445, 1565, 1705, 1830 m.
Long-tail CO, Cable CO, decreases (ssk, k2tog), increases (m1R, m1L), short row shaping, stitch pick-up around neckline for collar, circular knitting (sleeves and collar), and setting in sleeve caps. 12 page pdf includes pattern instructions, photographs, schematics, tutorial links, and definitions for relevant abbreviations.